I can examine your horse for physical issues, your saddle for fit, and adjust saddles on site or in my workshop (depending on what work is needed). I bring a number of demo pieces to illustrate our discussion and to explain elements of the saddle and how the saddle affects the horse's back. A trip fee depends on mileage. I am happy to split the fee between several clients (even visiting several farms in the area). There is a body evaluation fee of $50 per horse. 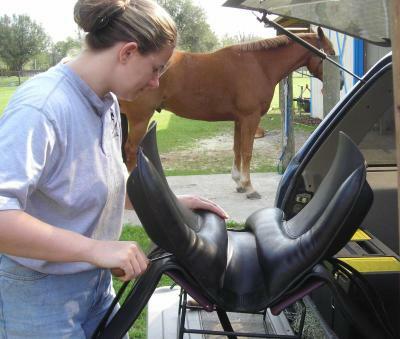 The body evaluation includes an evaluation of both the horse and the saddle. With the evaluation I have a chance to discuss the horse's condition with you, and how his body is reacting to his saddle and saddles he's worn previously. We will evaluate the horse's saddle for straightness, soundness of tree, and suitability to the horse. I am happy to examine as many saddles as you'd like to have on hand (borrow all your friends's saddles if you like!) I typically spend at least an hour in the evaluation and discussion. Saddle work is $45/hr plus materials (billets, etc), and in many cases, I can adjust a saddle with just one hour's worth of work. 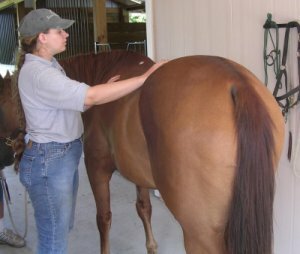 To adjust an English saddle we will first look at it on the horse's back as he stands square, then I will adjust the flocking. Once we are happy with the way it sits on his back, you will ride in the saddle so we can observe how it allows for motion of the horse's back, and the way it moves with the horse's back. We may need to repeat this process several times in order to get the fit as precise as possible. I have several more services I can provide while on-site: measurements for easy saddle shopping, deep massage work for the horse, as well as training/instruction advice. Once the visit is over, I am always delighted to hear from clients and to answer questions by email. Depending on the condition of the saddle, it might be possible to adjust/repair it on-site, or it might be necessary to do more extensive work (take it back to my workshop and bring it back or send it back to you via UPS). I do prefer to leave saddles with clients when possible :) Also working on-site lets me see the saddle on the horse and have you test-ride while I am still there. Call Galadriel (Geh-lae-dree-el) at 386-454-8863 or 352-871-2943, or click "Contact Me" in the sidebar to send an email, to discuss farm visits or make an appointment. Fantastic for: stiff horses, "ticklish" horses, touchy horses, grumpy horses, horses with muscle wastage, horses who aren't performing as well as they should. may be split among group.